Plastic + Hand provides world class cosmetic surgery right here in Portland, Maine. Our surgeons have trained at the best medical centers across the country. As part of the largest and most trusted independent plastic surgery center in Northern New England, they have successfully completed more cosmetic and reconstructive surgeries than any other. Plastic + Hand surgeons are fully trained in the reconstructive procedures that repair problems of the skin caused by injury, illness, tumors or birth defects. As aesthetic surgeons, they also perform state-of-the-art cosmetic procedures, while their specialty of hand surgery involves treatment of problems in the hand, wrist, and forearm, including microsurgery. Consultations within the practice bring their combined expertise to bear upon the medical problems of individual patients. Our primary office and surgical center is located at 244 Western Avenue, South Portland. We also operate clinics in the Midcoast at 105 Topsham Fair Mall Road, Topsham, and in New Hampshire at Memorial Hospital, 3073 White Mountain Hwy, North Conway. The Plastic + Hand clinical staff includes registered occupational therapists, x-ray technicians, registered nurses, surgical technicians, and physician assistants. Click here to learn more about Our Team. At Plastic + Hand, we want you to feel comfortable with your care. Our staff is always happy to discuss your concerns and suggestions. Plastic + Hand is a member of Specialty Solutions, an association of 11 independent physician practices working together to improve the coordination and quality of care, optimize operational efficiency, cultivate partnerships, and reduce costs. The association includes more than 250 physicians across 15 specialties. As part of our commitment to improving patient care, we’ve developed a quality report card focused on specialty medicine. Learn more at www.specialtysolutionsmaine.com or contact Beth Austin at 207-774-2345 x13. 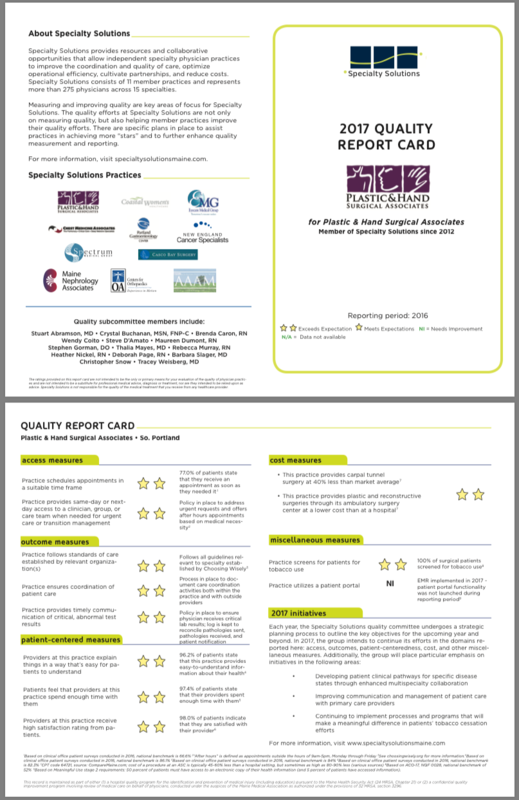 View the Plastic + Hand 2017 Quality Report Card.